Join us for Portland's First Zero Waste Conference on October 14th! In exactly a month, Portland will welcome its first Zero Waste Conference. And I'm very proud to be one of its 2 co-organizers. Brion Hurley and I met on various occasions over the past couple years, notably through Recycling Advocates, the non-profit he's the President of. We also both attended the Master Recycler Program and the Agent of Change training of the Center for Earth Leadership. Last June, he reached out to me and asked me whether I'd like to help him organize a Zero Waste Conference. 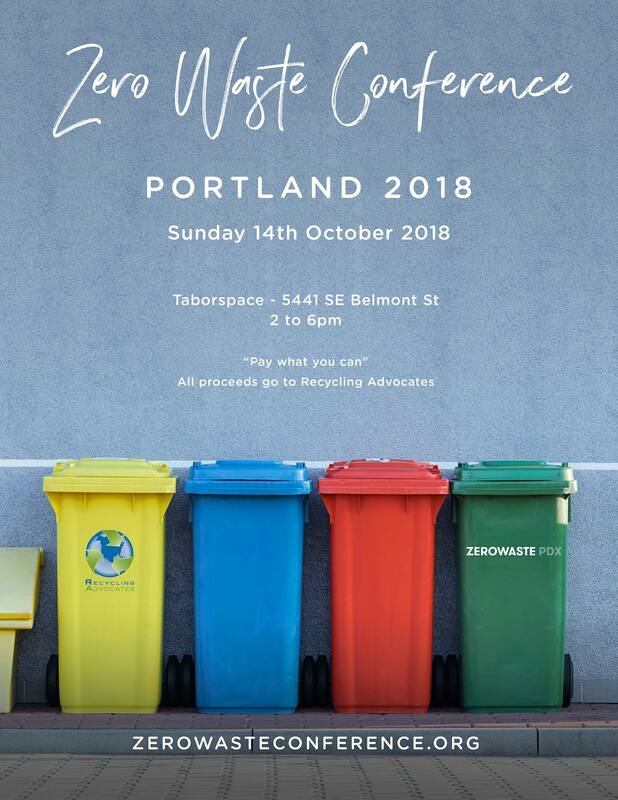 We are very proud to announce that Recycling Advocates and Zero Waste PDX will be organizing Portland's first Zero Waste Conference on Sunday 14th October from 2 to 6 pm at Taborspace, in SouthEast Portland. This event will be a “pay what you can” model, to give everyone the possibiliy to attend (our suggested donation price is $25 per person). All the proceeds from this event will be donated to Recycling Advocates.